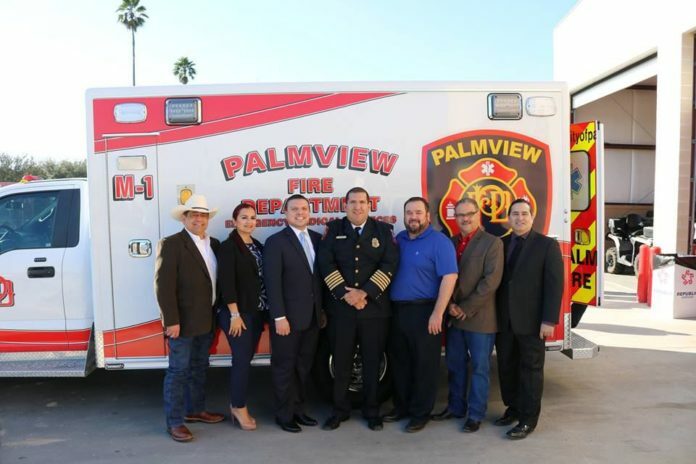 PALMVIEW — As the city continues to grow, the services it provides to its residents expand along with it. On Friday, the city initiated emergency medical services, or EMS, within its fire department. City council previously contracted private companies for those services, Fire Chief Jerry Alaniz said Thursday. Two years ago, however, the city began working on bringing them in-house. “We just wanted to make emergency medical services fire based and provide the highest level of pre-hospital care, which is the mobile intensive care unit level,” Alaniz said. To accomplish that, the fire department first converted to 24 hours. The department hired additional staff, which includes paramedics, and now are 24-hour fire services and EMS. Currently, they have a staff of 14, which is comprised of a combination of fire and EMS. Alaniz said the department hopes to have 20 on staff once the city purchases a second ambulance. “It changes things because we are providing mobile-intensive care 24 hours a day, seven days a week,” he said. The fire chief said the hope is to train everyone on staff to be a paramedic. Last fall, the city council approved two rounds of annexations, which brought in more than 3,000 residents. The expansion of their services, Alaniz said, was a part of being able to provide service to those areas; though, the annexations will not take effect until this summer. The fire department answers about 65 to 75 fire service calls per month and between 100 to 115 calls for EMS per month, Alaniz said Friday. The city’s current contractor for EMS, Hidalgo County EMS, will continue to provide their free services as backup.